The Cedar Fire of October 2003 was the largest wildfire in California history, burning nearly 275,000 acres and taking 14 lives and nearly 2,300 residences. It is from the ashes of this tragedy that Blue Sky Ranch has emerged, promoting the practice of Regenerative Design not only to allow the surrounding ecosystem to revitalize itself but for the community to assist as a participant in its development. It is our intention that the solutions for healing incorporated here at Blue Sky Ranch benefit the inhabitants of both the natural and built environments. Regenerative Design functions like a living organism, specifically adapted to a place and able to draw requirements for energy and water from the surrounding sun, wind and rain. Its inspiration is from nature; the beautiful terrain, landscape and flowers that surround the architecture. Sustainability as currently practiced is primarily an exercise in efficiency. With Regenerative Design we do better. By using the health of the surrounding ecological system as the basis for design, we move beyond sustaining the environment to regenerating its health as well as our own. Use environmentally sound building practices. Use alternative building materials to promote safety in a high risk fire area. 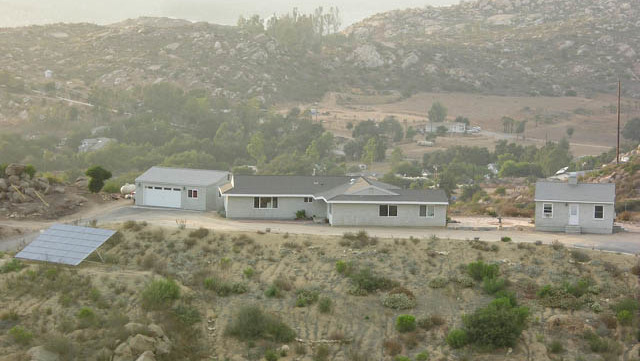 Use landscaping in a way to reduce a high risk fire area. Always find new ways to live harmoniously with the environment. Along with a cozy guest cottage, we purchased a 1,750 square foot ranch style house for use as the North Mesa dwelling. 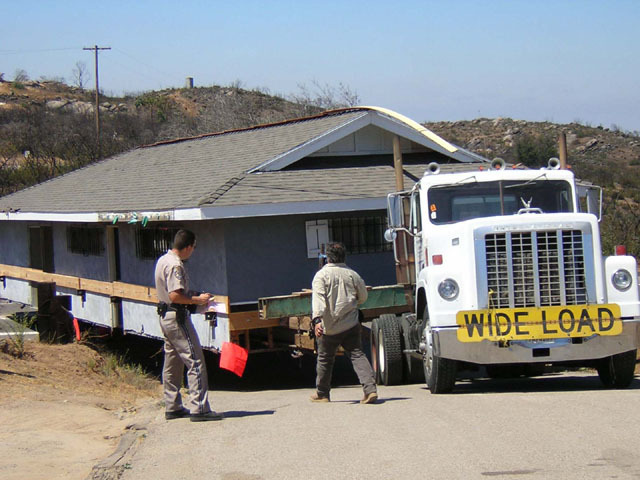 It was cut into two pieces and moved from San Diego to its new location at Blue Sky Ranch. We increased the size of the house and brought it up to Code utilizing all of the energy saving techniques available to us. This included a solar electric (photovoltaic) system, plumbing for gray water, double paned windows, radiant barriers, retrofitted cellulose insulation (R13 in walls and R30 in ceiling), appropriate heating and cooling systems, heat on demand water heaters, Energy Star appliances, low VOC paint and porous pavement, which accumulates less heat. We also installed ceramic tile flooring throughout the house to encourage passive solar in the winter and heat moderation during the summer. 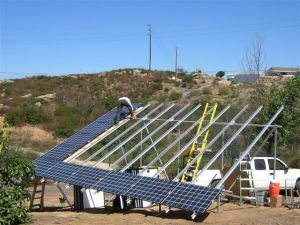 After the completing the installation of our five solar arrays, we participated in the Solar Homes Tour sponsored by the San Diego Regional Energy Office (California Center for Sustainable Energy). We are pleased to help educate the general public about the benefits of solar energy. Part of the debris remaining after the Cedar fire was a lot of concrete – sidewalks, driveways and porches. 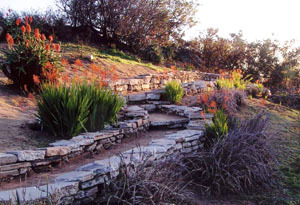 Rather than break them up and send them off to the landfill, we used the chunks as artistic and functional retaining walls in our garden of African plants. As each construction project unfolds, we document it as an educational resource. Then we open our home to the public on a regularly scheduled basis so that others can learn from our experience. Each project uses the safest and most advanced eco-centric building methods available under the current County codes. The Blue Sky Ranch Community is dedicated to living a sustainable lifestyle. We recycle our paper, compost our kitchen waste, collect rain water, utilize gray water, and feast from our seasonal garden and orchards. 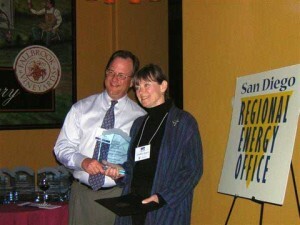 For her sustainability work following the Cedar Fire, Ingrid Coffin received the 2007 SANDEE Award for Energy Excellence. © 2019 Blue Sky Ranch Community. 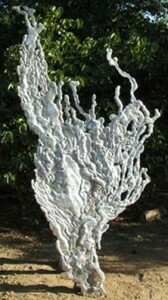 2007-2019. All Rights Reserved.